This begins a series of what I hope to be a useful and thought-provoking exercise in UX. Using principles learned in my classes and experience as a consumer who appreciates smart design, I will take a look at some of my favorite (and not so favorite) websites, and analyze their design. What is good about it? What can be improved? Why is it the way it is? Why isn't it different? The goal is for me to improve my UX skills, and provide some insight along the way. This time I will examine Pandora. I'm sure most you have heard of Pandora, and many of you use it. Pandora is an internet radio site that lets you stream music. It uses the Music Genome Project to build radio playlists based on what artists you select, and which songs you like or dislike. As you can see the clear focus is on what Pandora is. This is great for new users. However, given how well-known Pandora is now, I feel that their primary user is someone who already has an account, and uses Pandora frequently. As one of these users, I have always been a little bit annoyed at the log in process. The good thing is that Pandora provides two locations to click to move on to the next step. However, both are small, and do not stand out well. Earlier this year, 1366x768 became the most popular screen resolution. In fact, nearly a third of all screens have 900 or more vertical pixels, and over 50% of all screens are in widescreen format (StatCounter). I bring this up to illustrate that consumers more and more have high resolution, wide screen monitors. Pandora's sign in process involves all small elements that do not scale very much with the increase screen resolution. This means that the sign in buttons stay small, and the mouse travel time is very far from, say the address bar to either sign in button. The top sign in button, especially, is extremely far away from anything related to the rest of the sign in process. Perhaps Pandora's research showed that few users actually click up here. However, convention dictates that log in/sign in should be located in the top right of the screen. Maybe they assume that since people know to look in the top right, they don't have to worry too much about formatting the log in button. As you can see the center element transforms on the sign in click to reveal the actual sign in fields. This is pretty slick, as it's already where people are looking, and is a great location right in the middle of the screen. I would like to see field auto-focused on the click, as it is obvious someone who clicks on sign in wants to enter their info and access their stations. Why add the extra step of having to click on the field (or tab over)? I've pasted the Hipmunk search field next to Pandora so you can see what I would like Pandora to do. Very simple, but a nice subtle touch, and a big improvement in experience. All in all, though, these are minor quibbles. Let's look at the main interface for actually using the site. So this is the main screen for listening to music. Very clean. Lots of information, but still very minimal. Let's break it down. From the top, the first thing is the new station bar. I like this because although it is in a typically prominent part of the webpage, it is out of the way as far as this webpage is concerned. This contrast allows the user to ignore it in most cases, but easily find it again if he wants to use the feature. The main controls are also at the top of the page. This makes sense to me. Like/dislike, play/pause, skip, and volume. Not too complex, but enough to get the job done. This isn't foobar or winamp for power users, this is an internet radio station for casual listening. I'm not sure the song/artist/album/album art cluster in the top right is necessary - since the same information is front and center, and there is no time I can think of when you would have the window sized so it just shows that top bar - but hey, I like it. 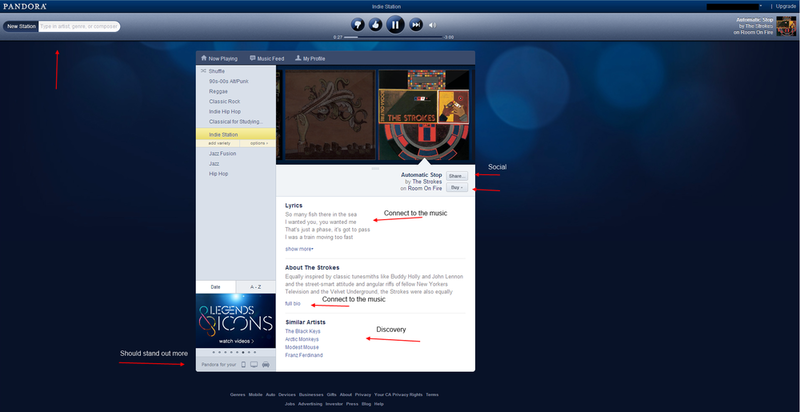 The main box on the page consists of the stations, the album art, and the song/artist information. I think it is effectively done. I would consider making the album art larger, as big, high res pictures seem to be the trend lately. A cool future feature might be having the album art rotate with pictures of the band. 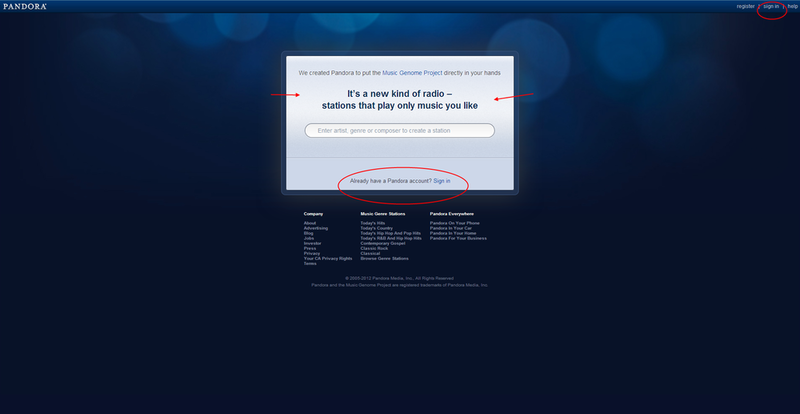 You could say, hey cp kelley, that's stupid, most people use Pandora in the background, only going to it to change songs. And I would totally agree with you. But, let's take a look at the rest of the page. I think the share and buy buttons are well done. Too much bigger/brighter, and they become overt and obnoxious. I would like to see the 'Pandora for your phone/home/car' area stand out more. This may have to do with the whole 'let's be subtle about everything' theme. Regardless, the more people know they can access Pandora elsewhere, the more they will listen to Pandora elsewhere, and the more they will seek out ways to get the products that allow them to listen to Pandora elsewhere. Feature-wise, I think the like/dislike/tired-of-this-track/skip method provides for a great experience. Songs you don't mind hearing frequently are liked and songs you don't want to hear ever are disliked. You can skip songs you don't feel like listening to right now, but want to keep in the rotation. Pretty standard. But what if you only kind of like a song? What if you used to like it, but have heard it too many times recently (e.g. Foster the People, Adele before the radio and tv commercials figured out about them)? Well, Pandora is glad you asked! Simply use the "I'm tired of this track" function, and they will "put it on the shelf for a while." This isn't a huge feature, but it is a nice touch, and something that makes me glad to use Pandora (as opposed to putting up with a lackluster feature). *Note: In an attempt to get these last screen caps, I waited for Pandora to load a song I didn't really care about. I waited for an hour. Apparently, Pandora knows me too well, and rarely serves up a fault. This, too, makes me love using Pandora.